After a long wait, 2017 finally saw the second season of the break-out hit Attack On Titan. Users of Crunchyroll and Funimation Now may have already seen what happens next to Eren and his friends, but what about those who have been waiting for a boxset? We have good news for Titan fans in the UK, as it has now been confirmed that the second series will get a home release this coming February. As well as a standard DVD and Blu-Ray release, a Limited Edition Blu-Ray Set has been announced. This edition will include on-disc extras such as episode commentaries and interviews, plus two books: The 24-page Notes From Beyond the Wall: Part III and a 60-page art book. The UK release comes from Funimation and Sony Pictures Entertainment. Up until recently, Funimation releases have been distributed in the UK via Anime Limited. It seems that since Sony acquired Funimation a few months ago, they will now be distributing titles in the UK directly. 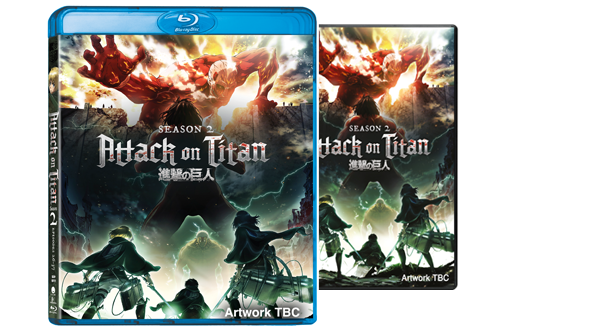 Attack On Titan Season 2 will be available on Blu-Ray, DVD and Limited Edition Blu-Ray on February 26, 2018. Full release details below! Eren Jaeger’s battle against the Titans rages on! After fighting the female Titan, he has no time to rest as a horde approaches Wall Rose. With his ferocious abilities and a new plan, Eren and his friends set out to face the Titans head-on. But as they prepare for war, they begin to unearth terrifying secrets. What are the Titans really, and where do they get their power? As they begin investigating the danger hidden within the walls, a colossal reveal shakes them to the core! More Titan shifters are identified, and worse yet, a new Abnormal appears – the horrifying Beast Titan! Does humanity stand a chance at survival with no one to trust and a new evil on the horizon?